We are proposing to establish new ATS Routes and CAS for Birmingham arrivals and departures via the MOSUN area. There are currently no flight plannable routes to/ from the South-West within CAS, which airlines can use. These flights have to currently leave CAS and are provided with a Flight Information Service (FIS). NATS proposes the provision of an offload route and CAS for Heathrow inbounds, for when the OCK (Ockham) hold is at full capacity. 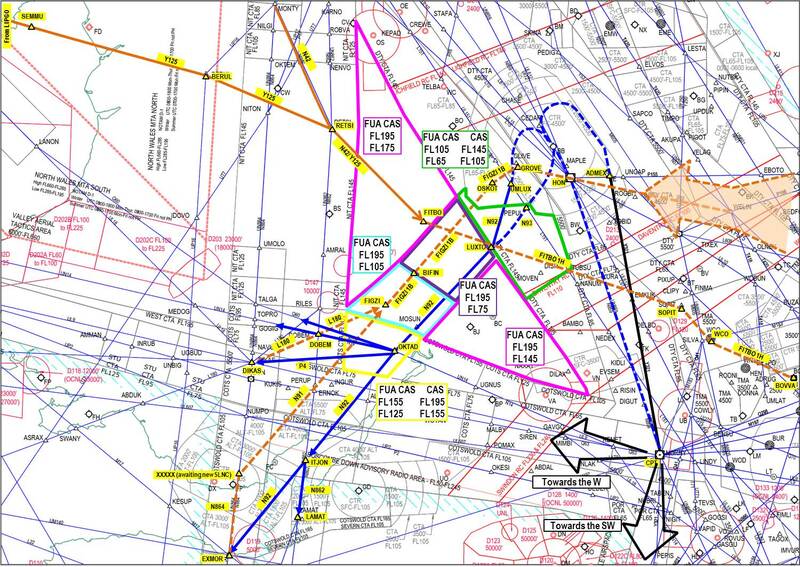 These flights are currently vectored from the southern flow to the northern flow. This has occasionally led to extreme traffic loading and complexity within this region, affecting both ATC and pilot workload. A combined image of the proposed Birmingham and Heathrow changes can be seen below. Further information can be found in Sections 4.3.1 and 4.3.2 of the Consultation Document which is embedded below. As part of this proposal we are proposing to introduce five new high-level ATS Routes in the West End Sector Group. These have been designed to reduce fuel uplift/ burn and associated emissions for airlines. These have been summarised below including a diagram for each. They can also be viewed in Section 8 of the Consultation Document, embedded below. 1) Q60: realignment and extension of KOPUL - UGNUS. 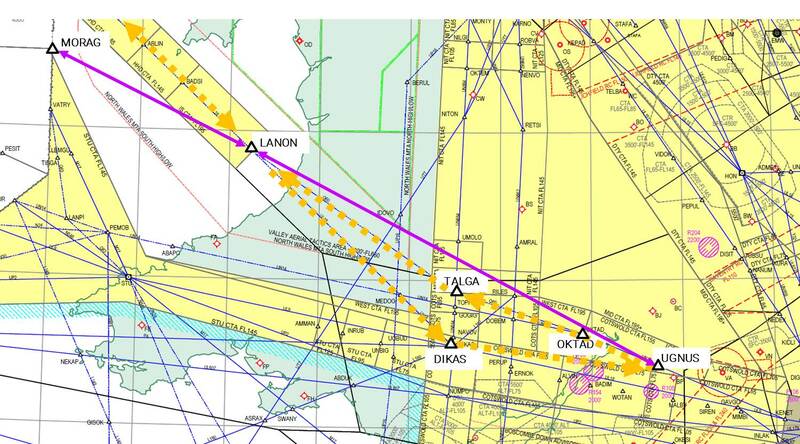 A westbound route for LTMA overflights which route from Europe/ further East to Ireland/ North Atlantic. This is shown below. 2) Q60: MORAG - LANON and LANON - UGNUS. 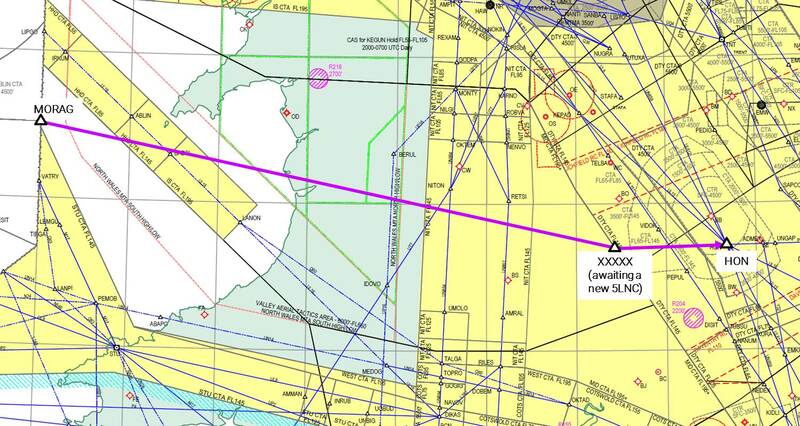 A bi-directional route for LTMA overflights at FL340+ and Dublin arrivals. This is shown below. 3) N24: extension of PEMOB - NIGIT. An eastbound route for London FIR overflights at FL285+. This is shown below. 4) P155: MORAG - XXXXX (awaiting a 5LNC) - HON. 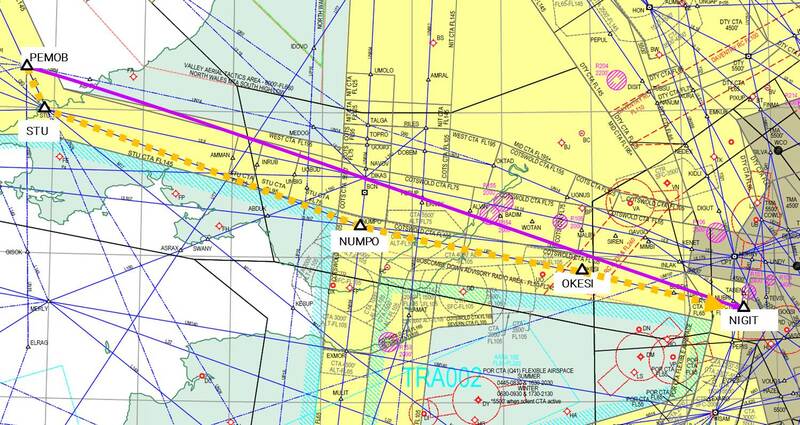 An eastbound route for UK overflights exiting via SOMVA and REDFA. This is shown below. 5) UL18: GAVGO - DIKAS. 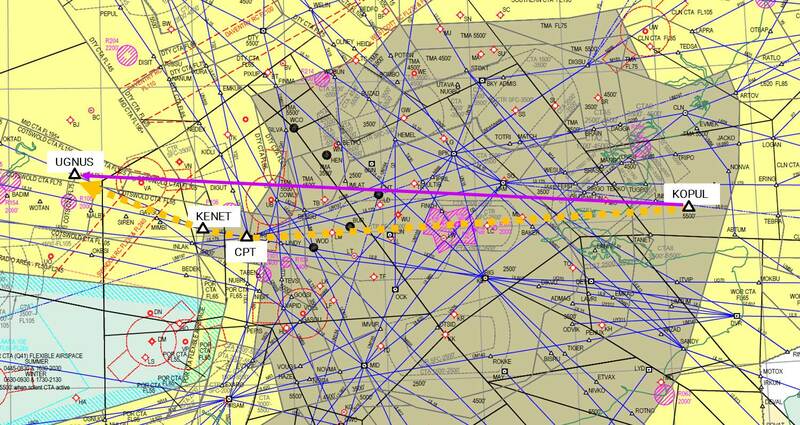 An eastbound route for UK overflight traffic. This is shown below. 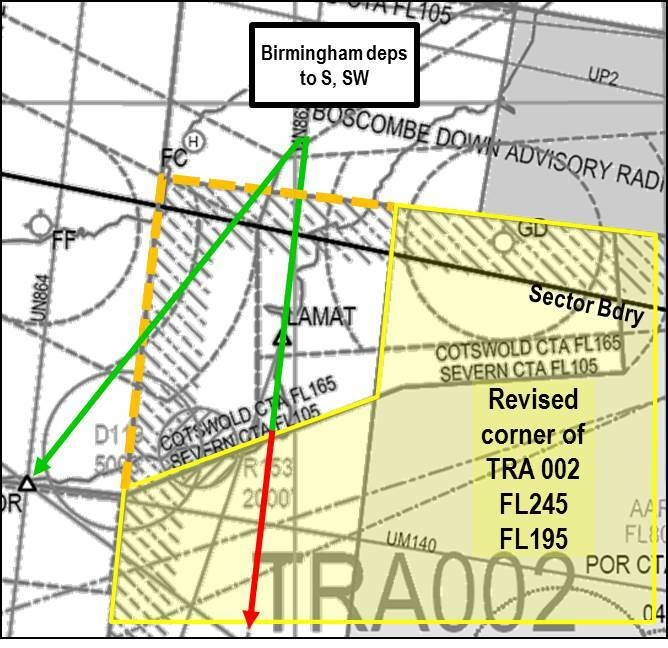 We are also proposing to amend and reclassify the north-west corner of Temporary Restricted Area (TRA) 002, so that Birmingham departures on proposed ATS Route N82 do not need to be tactically vectored. We have agreed this change with the MoD. This proposed change can be seen below and is also summarised in Section 4.3.4 of the Consultation Document, embedded below. An impact assessment indicated these proposed changes would enable an annual saving of 1,806T fuel and 5,743T CO2 in 2020, after implementation. These environmental benefits are due to more direct routings and therefore less track mileage. 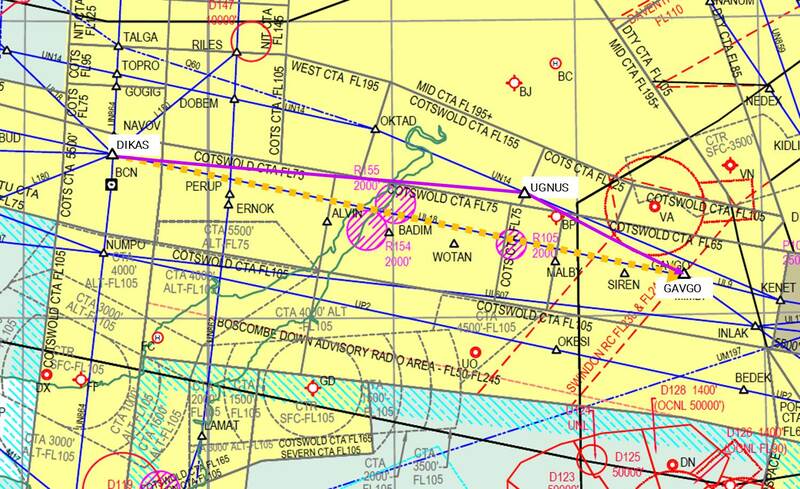 The changes proposed in this ACP would not change commercial aircraft traffic patterns below 7,000ft. As covered in the consultation document, the changes could potentially alter some GA traffic patterns outside CAS and below 7,000ft. We will not commit to respond to postal responses directly; however respondents are welcome to include a stamped envelope if they do require a reply. Primarily, respondents are likely to be users of the airspace and aviation stakeholders. Nonetheless we welcome feedback from any interested parties.